﻿ As China Adjusts for “True Cost” of Rare Earths, What Does It Mean for Decarbonization? Known as the “vitamins of industry,” rare earths refer to a cluster of minerals widely used in green technologies such as wind turbines, rechargeable batteries, and electric vehicles. Rare earth elements embedded in these products keep them light, efficient, and affordable. They’re essential to the decarbonization of the global economy envisioned in the Paris Climate Agreement, agreed to by 192 countries in 2015. And we may soon face a significant shortage, due in no small part to changes in China. The U.S. Department of Energy and European Union have both issued warnings of impending rare earths shortages. Medium and heavy rare earths, mined almost exclusively in China at the moment, top the list with the highest risk of shortage. Years of pollution suffered as the world’s dominant supplier of rare earths have taken their toll on China’s soil, water, and people. In some cases, ponds of untreated tailing slurry have led to severe radioactive contamination. As the government begins cracking down on illegal mining and black markets and increasing environmental regulations, operation and compliance costs are going up. In the years ahead, China may struggle to meet domestic demand for rare earth minerals, much less global, even as momentum for “green” technologies increases, according to a report from China Water Risk. From 2001 to 2011 China supplied 90 to 98 percent of rare earths in the global market. 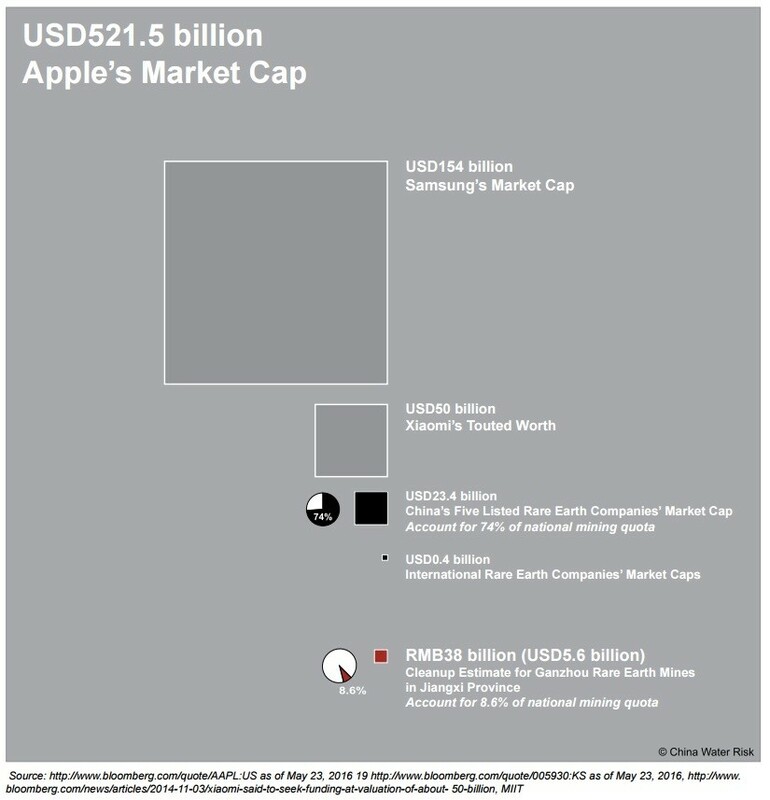 The cost of such market dominance, however, has also been large. In 2012, the Ministry of Industry and Information estimated that the clean-up and rehabilitation costs from small-scale rare earth mining in Ganzhou City over the last two decades were a whopping $5.5 billion (RMB38 billion), a bill currently being covered by China’s central finance and local governments. Ganzhou, known as the “Kingdom of Rare Earths,” only accounted for about nine percent of China’s national rare earths extraction quota in 2015. It’s unclear how large the environment and health bill might be when accounting for the other 91 percent of rare earths produced in China, but it’s undoubtedly high. Yet, neither the strategic value of rare earths nor the astonishing environmental and health costs are reflected in current prices. In fact, due to low prices, the idea of recycling rare earths only began to receive consideration after China imposed trade quotas in 2010. The recycling rate of rare earths in end-of-life products is still extremely low. In 2014, the UN Environment Program reported a global recycling rate of less than one percent, mostly on account of light rare earths from energy saving light bulbs instead of the scarcer medium and heavy rare earths used in electronics. In 2012, when China attempted to better reflect environmental remediation costs in rare earth prices as duties and taxes, the United States, European Union, and Japan framed it as restriction on trading rights and an unfair trade barrier. They brought the dispute to World Trade Organization and won. The WTO ruled China’s quantitative control policies were “not justified under the exception of conservation of exhaustible natural resources,” as China claimed, nor were the export duties “necessary for the protection of human, animal or plant life, or health.” As a result, China eliminated the export duties and quotas, pulling the price down a further 15-25 percent. Under the current pricing failure, neither companies in the supply chain nor individual consumers pay for the associated costs of rare earths extraction and processing. Scarcity values are also absent from price calculations. When China cut its export quota by 22.5 percent in 2010, the market responded with a panic attack and prices temporarily doubled or tripled in the following year. This pricing failure has made extraction and processing a losing business proposition. In 2015 the rare earths industry in China suffered a $116 million (RMB800 million) deficit and the situation continued in 2016. Outside China, two of the largest foreign rare earths companies filed for bankruptcy in 2015. One of these companies, U.S.-based Molycorp Inc. (later restructured as Neo Performance Materials), was once the largest rare earths supplier in the world before China’s emergence in the mid-1990s. With the prospect for new duties slim, China must find another way to finance domestic clean-up while increasing compliance in this low-margin business. The answer may lie in consolidation. After decades of wild growth, China’s rare earths industry is marching towards the type of nationalization that its iron and steel industries experienced decades ago. Such a shift could help improve compliance with environmental regulations and reduce rampant black market trading, illegal mining, and pollution. In 2016, the government introduced a series of guidelines and plans to do just that, including a National Traceability System on Key Commodities (including rare earths), a National Purchase and Storage Mechanism for Rare Earths, and the first-ever Five-Year Plan for the Rare Earths Industry. According to the new plan, the country’s industrial capacity in rare earths extraction, smelting, separating, and comprehensive utilization will be consolidated into six state-owned enterprises by 2020. Consolidation and stricter regulation could help rein in mismanagement and pollution. The five-year plan sets a goal to reduce major pollutants discharged from the sector by 20 percent and to encourage innovation in rare earths recycling and green applications. The recently amended national Environmental Protection Law, mandating harsher punishments for polluters and local governments that protect them, could also catalyze stricter enforcement. The “six groups,” as the consolidated state-owned rare earth companies are known, have met with China’s National Development and Reform Commission to discuss details of national purchase and storage, which would increase central government control over domestic supply. In a recent national storage bid in January 2017, the State Reserve Bureau purchased over 2,000 tons of rare earth oxides from five of the six groups. The consolidation of state-owned companies and national control over storage are designed to address environmental problems and industry viability, but they will also affect major companies like Apple and Siemens that make profits from selling smart phones and wind turbines. After years of relying on China’s cheap rare earths, these companies will be forced to find substitutes or raise consumer prices. These changes may also affect national low-carbon energy plans. Germany has more than 24,000 wind turbines installed. How many were built with cheap rare earths from China, some of them perhaps mined illegally or dangerously? Will higher rare earth prices affect renewable investments in the future? China itself plans to spend $360 billion on renewable energy by 2020. We argue in our report, however, that these changes are long past due. It’s time to recalculate the true cost of rare earths in China – and the price for a truly sustainable low-carbon future. This blog is based on the report, ‘Rare Earths: Shades of Grey,’ published by China Water Risk in July 2016, and available in English and Chinese. Hongqiao Liu is a consultant for China Water Risk, a non-profit initiative based in Hong Kong dedicated addressing business and environmental risk arising from China’s limited water resources. Sources: China Water Risk, Chinese Academy of Sciences, China Economic Daily, European Commission, German Wind Energy Association, Government of China, The Guardian, Hong Kong Commercial Daily, Ministry of Finance (China), The New York Times, Sina, Sohu, Southern Rare Earth Products Exchange and Trading Center, U.S. Department of Energy, World Trade Organization. 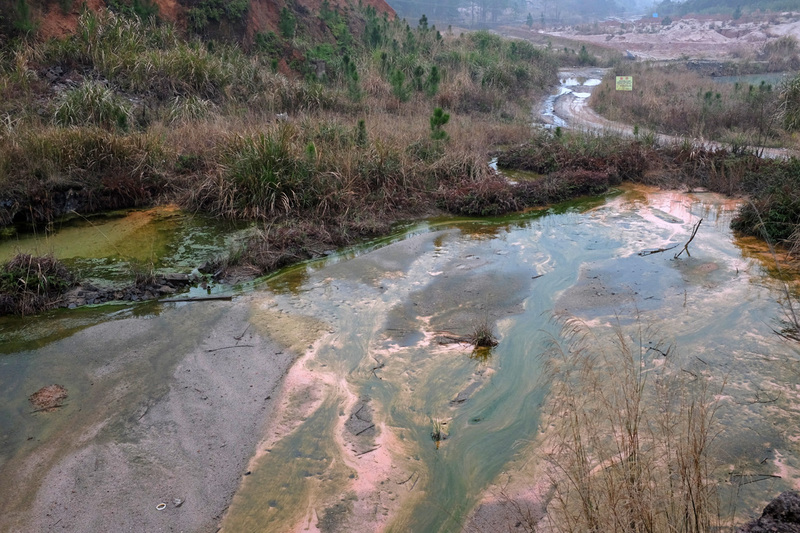 Photo Credit: An abandoned mine site near Ganzhou City, used with permission courtesy of Hongqiao Liu. cant understand a country that has ruined its lands for a loss? some greedy local administrators and factory owners are partly to blame it is them that have no conscious or interested in conservation for future generations to come a time will come that they will be tracked down and be held accountable it wont be hard to find out who they are , But the blame is also all of us the end user of these products who ask for no accountability and question where the product comes from, START ASKING and things will change. Your an idiot its China ask questions, demand change ,… GET SHOT SMFH! Capitalism couldn’t survive without the poverty of Communism. Our capitalist system couldn’t survive without cheap materials and labor from countries that abuse human rights and the environment. The United States takes advantage of those, usually Communist, countries, and mark up the price on goods.